Supports healthy hearing, including low and high tones. Combats noise-induced hearing issues. Fosters healthy nerve function in the auditory system. Delivers 9 important ear vitamins and minerals to support healthy nerve function. Listen up! Hearing issues now occurring in younger Americans. Did you know hearing issues are the third leading health condition in the country? It affects nearly one-third of Americans between 65 and 75 years of age and nearly half of those over age 75. But it's not just a problem for the elderly. In an era of cellphones and ear buds, hearing loss is now affecting much younger people too. According to researchers at a major university, one in five people between the ages of 48 and 59 already experiences reduced levels of hearing. While age and heredity do contribute to hearing issues, so does: Ongoing exposure to loud noise; Ear wax buildup; Certain medications; Exposure to substances like tin, lead, or mercury that damage the inner workings of the ear; Ear infections; Fluid buildup after a cold or traveling on an airplane; Health conditions such as blood sugar, heart or blood pressure that reduce blood flow to the inner ear or parts of the brain. Addresses multiple reasons for hearing issues: You'll be thrilled to learn there's now an exciting formula that addresses the various causes of hearing issues. 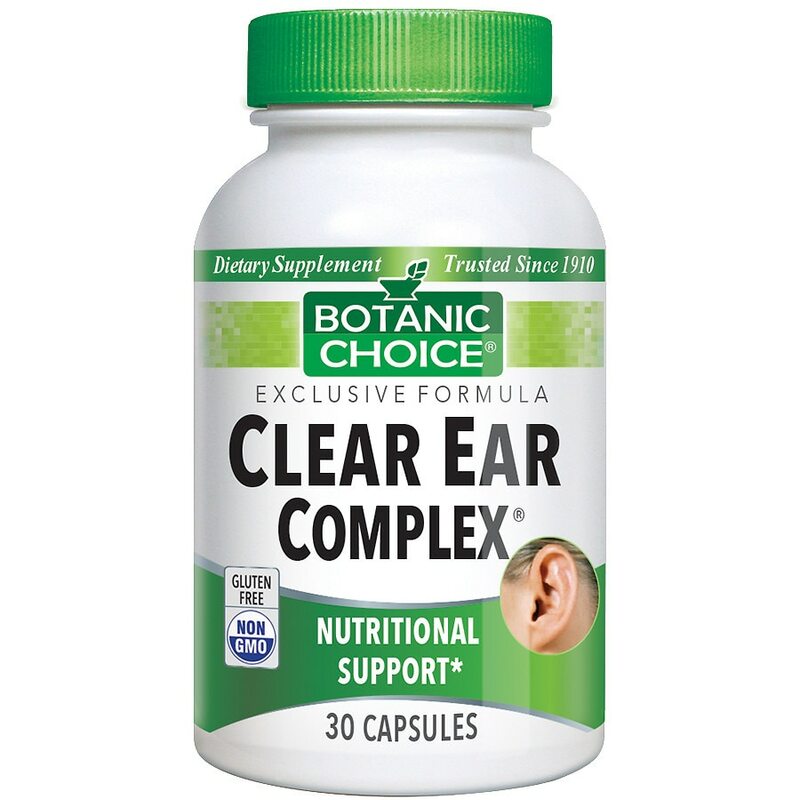 Clear Ear Complex nutritionally supports all auditory functions and protects all areas of the ear. Delicate structures with a complex function. Clear ear complex for hearing support. The ear consists of three key areas: external ear, middle ear, and inner ear. Sound passes through the external ear and cause vibrations in the eardrum. The eardrum amplifies the vibrations as they pass onto the inner ear, cochlea, nerve cells and tiny hairs that help translate and send signals to your brain. The tiny hairs and nerve cells can become damaged due to the causes above and create hearing issues. As you can see, it’s a complex process with many moving parts. A unique combination of four super-charged B vitamins, an "Inside Secret" for healthy hearing. B vitamins are involved in normal auditory function and foster healthy blood flow to all parts of the body, including the ear. The problem is, most B vitamins cannot be stored in the body and many of us fall way short of getting what we need. Since B vitamins must be replaced daily, we've included a generous amount of them in Clear Ear Complex. For example, each daily serving delivers a full 10 mg. of B-1. Also known as Thiamin, B-1 helps stabilize the nervous system, especially in the inner ear. And, we've included 30 mg. of B-2 (riboflavin) because B-2 is believed to enhance oxygen use in the ear's cells. The more oxygen circulating, the healthier the ear. Ingredients studied for hearing: To that we've added B-12 and B-9 (folate), both studied extensively for their role in hearing. In one such trial, 2 researchers studied healthy women aged 60-71, and it was discovered that women with impaired hearing had 38% lower levels of vitamin B-12 and 31% lower folate than women with normal hearing. That's why we've included a generous amount of each with 200 mcg. of B-12 and 800 mcg. of folate. This helps ensure you're getting enough of each for maximum benefit. Additional hearing supporters to enjoy greater safety, freedom and quality of life: While zinc is popular for immune support, it's also been studied for its effect on hearing issues that come on suddenly. It's believed that zinc can also help safeguard your ability to distinguish the many nuances of sound including timbre, balance, tone, pitch, bass and treble. Based on this, we've included a full 20 mg. of zinc. Provides two powerful free radical fighters: Increasing evidence suggests that very loud noise generates free radicals that damage the hair-like cells in your ears. Using antioxidants to protect the inner ear has been widely studied, most recently by the U.S. military in combat situations. The focus has been on N-Acetyl-L-Cysteine, which appears to act like a built-in earplug. So we've included 30 mg. of this vital nutrient. The "universal" antioxidant, alpha lipoic acid, has also been studied for its effect on the cochlear tissue in the ear and its involvement in boosting the effectiveness of Vitamins C and E. Clear Ear Complex delivers a full 20 mg. of alpha lipoic acid. Two more natural hearing secrets: When it comes to protecting your ears, it's hard to beat magnesium. It's been repeatedly shown to ease the occurrence of both temporary and permanent noise-induced hearing issues. What's more, a magnesium deficiency increases susceptibility to noise damage. That's why we've added 100 mg. of this important mineral. ¿ Finally, we've included 10 mg. of vinpocetine, an alkaloid phytonutrient which has shown promise to help ease the effects of medications and hearing issues. The combination of these nine ear-supporting ingredients work together to give you superior hearing protection today and tomorrow. It doesn't have to be that way! Now you can keep your ears healthy and maintain sharp hearing so you can keep your independence with support from Clear Ear Complex. ¿ Let’s Hear it for Clear Ear Complex! Gluten free, non-GMO.